A substantial Regency country house built in 1821 with subtle Grecian accents and a French influence situated within a 35 acre estate in the romantic Channel Island of Guernsey, some 20 miles off the English coastline and closer to France than the UK. The main house is situated at the heart of the estate and is surrounded by a series of detached cottages, sports facilities, ornamental ponds and various other out-buildings. 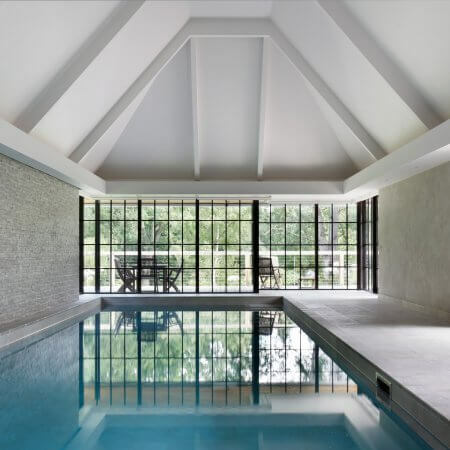 In recent years the Grade II property had been variously used as an hotel and a private members’ club and was in need of a major refurbishment, as the house looked tired, was unloved and had become a bit of an ugly duckling. One of the attached buildings had been a public house in a previous life, which was well known to many Islanders. The ‘Wishing Well’ as it was called, was named after the historic well situated in the grounds. The property is owned by a successful business entrepreneur with substantial property and sporting interests in the north of England. The brief asked that Janine Stone implement a full interior design and refurbish from the bare brick structure to the exquisite interiors that can be seen today. To encompass the Channel Island’s cultural and historical influence, the clients desired a traditional English inspired classical interior with a French twist featuring elegantly faded and lightly aged interiors to create an enduring and authentic look for their home. From the new floors, fine wood panelling and the grand staircase to the installation of sumptuous his and hers bathroom suites; every aspect of the decoration was designed to look as if it had been there since the house was built. 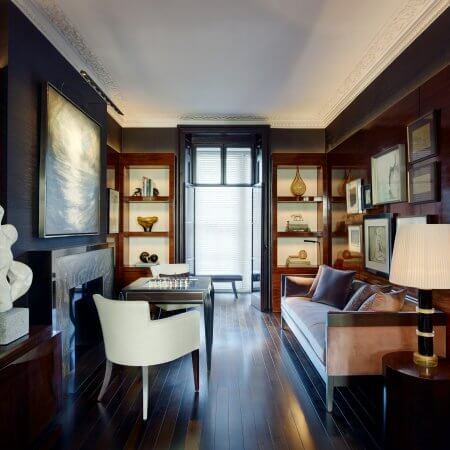 The client’s collection of antiques and original artworks were elegantly accommodated throughout the interior. The exterior was re-modelled to improve the proportions and overall layout of the house with the addition of a stunning new pool suite and an exquisite garden room. They were created to enhance the entertainment areas and take full advantage of the sweeping parkland views. From the beginning, Janine Stone worked closely with the owners to ensure their vision of how they wanted to live and enjoy their family home was fully realised, this productive relationship ensured a seamless transition of the major refurbishment and build elements delivering a period home fit for the 21st Century and beyond. There was particular emphasis by the team of artisans on specialist paint and wood finishes which achieved a sophisticated period look and were so finely observed as to trick the eye into seeing an historic wall treatment. Janine Stone’s craftsman from the mainland and from the island itself used traditional methods to create custom made cabinetry, ironwork, glazing and the latest innovative solutions for temperature and lighting control and for the storage and enjoyment of the client’s collection of rare and fine wines. A stirring residential project which transformed an erstwhile ugly duckling into a swan. The property was endowed with a sense of elegance and refinement from the use of traditional and rare materials and their expert application to create an outstanding country residence which exudes unparalleled luxury and comfort. The Janine Stone architectural, interior design and project management services were utilised for this project alongside a range of Janine Stone managed and directed consultants.